Momma Told Me: You're going to get chocolate all over that controller! I love video games. 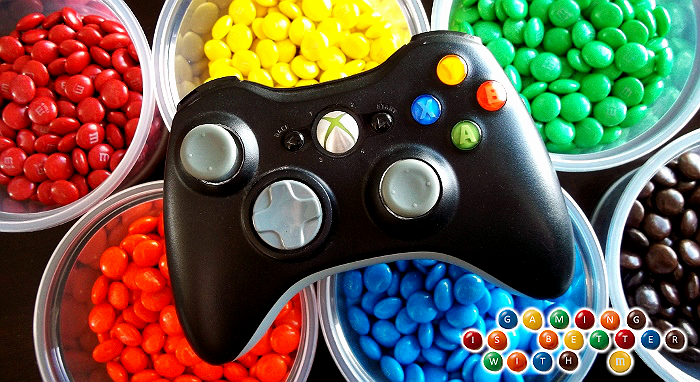 If there is one thing I love more than video games, it's chocolate. When I can enjoy them both, together, it is truly a version of nirvana for me, I am in my element. And that's why gaming is better with M.
Not only have countless late night video game battles been waged and won, #FuelledByMM, but these candy coated chocolates hold memories as far back as my first Atari console. With dozens of flavors, and seasonal varieties, it's not hard to spot the party sized Ziplocs or the fun sized M&M pouches stashed by the gaming station in our home. Occasionally we'll throw a few in a bowl with some pretzels and Chex for a crunchy sweet and salty gaming mix that is always bragged about in online chat rooms. Yea, we're a gaming household, but we're also an M&M family, and that means every new release party, every console unboxing, and every midnight Just Dance-off is paired with a helping of our favorite rainbow chocolates. I've shared before the sentimental tale of a toddler in pig-tails clutching her father's pant legs as she nods off to sleep, The Legend Of Zelda (1987) theme music looping as her lullaby in the background. It's no secret I grew up attached to consoles, and the painted stories of fantasy and role-playing captured within them. I even attended the Art Institute of Los Angeles, straight out of high school in hopes of becoming a famous female programmer. And, while it turns out making video games is a lot more match and science than this starry-eyed fan anticipated, I still hold a romantic candle to the notion today. If there wasn't the practical, type A, side of me constantly nagging at my sense of reason and responsibility, I would happily resign to my couch with a bowl of M&Ms and the latest console release. So, when I heard my favorite candy coated chocolate was teaming up with the newest, Xbox One, console release in an exclusive Buy, Snap, Redeem promotion with Forza Motorsport 5, I was understandably excited. My very first Xbox console had been bundled with this state of the art, realistic, racing game that at the time has pushed physics boundaries with realistic damage rendering and over 230 playable cars. When it came to placing the player into the driver's seat, the Forza franchise had it all; and I can't wait to experience modern day graphics engines paired with the Xbox One and Forza franchise. That's why I'll be heading to my local Walmart to pick up my copy for Forza Motorsport 5, and 2 participating packages of M&M's to Buy, Snap, and Redeem for an instant $10 eCode good at Walmart.com. It's as easy as making the purchase, snapping a photo of your receipt by 12/31/2013, and texting the image to 811811 with the text code: M&M by 1/1/2014. Participating products and complete Buy, Snap, Redeem information can be found here. But these two brands haven't stopped the Xbox One and Forza Motorsport 5 buzz there, they are also launching an incredible interactive sweepstakes where customers are encouraged to actually play with their food. That's right, let your geek flag fly with the Gaming With M Pixel Art Contest, where one lucky pixel artist will take home a new Xbox One console and Gaming Is Better With M prize pack featuring Forza Motorsport 5, or the cash equivalent to $600! How's that for a chance at a little extra holiday cheer? The sweepstakes will run from December 4, 2013 to December 18th, with the winner being drawn at random from all eligible entries. 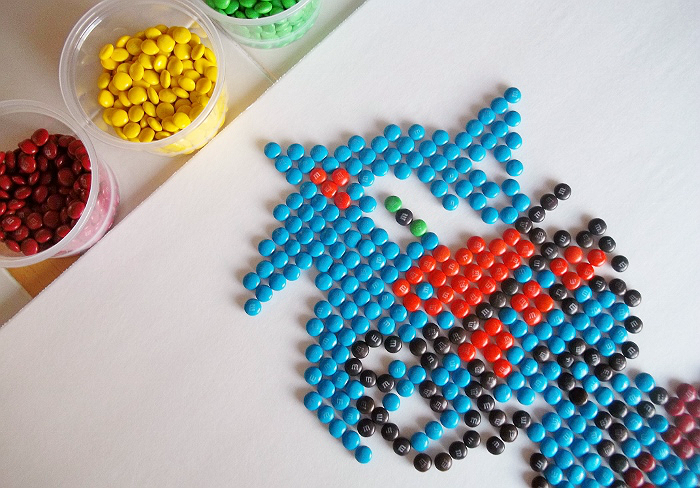 Pick your favorite video game character, icon, or logo, and turn them into M&M pixel art, then snap a photo and Instagram or Tweet your image with the hashtags #FueledByMM AND #Contest to get entered to win. Each person may enter up to 3 times during the entry period, to maximize their chances. 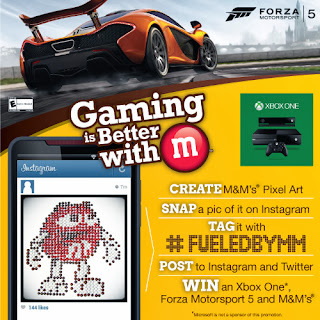 Follow the #FueledByMM Pixel Art contest online to see all of the creative entries! I was a little more than enthusiastic when I got wind of this exciting Gaming Is Better With M Pixel Art Contest, and quickly hurried to my local Walmart shelf to pick up some art supplies. Here there were many options for suitable mediums, from pretzel and holiday exclusive gingerbread, to minis and dark. 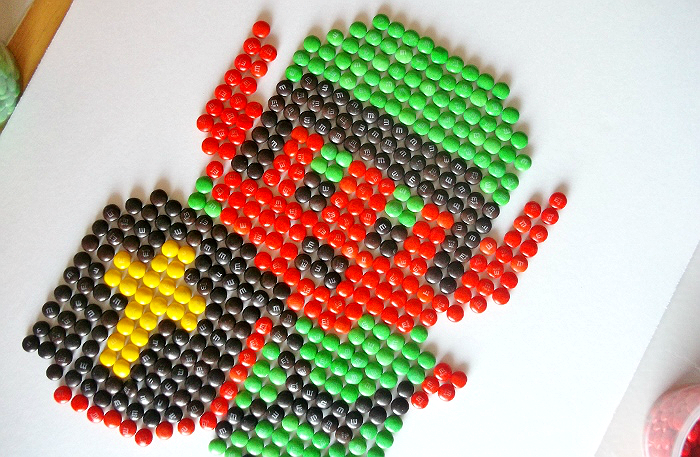 I found the simplest to 'build' with were Original and Dark M&M's that could be found in holiday colors (Red and Green only) that would work well to give you many candies of the same color for larger pixel art creations. 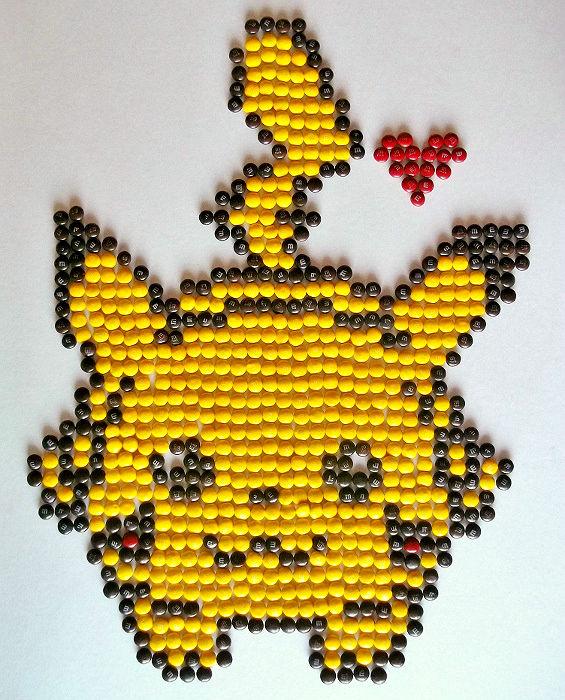 I also learned quickly that Dark M&M's, though my favorite, were not the best pick for Yellow candies to make my favorite character, Pikachu, featured above. 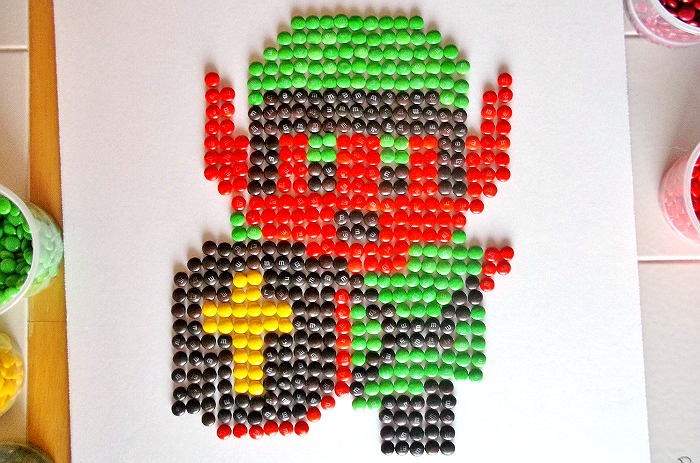 For those looking to have some real fun, and go big with their pixel art creations, I suggest investing in the ziploc Party Size packages of Plain M&M's, which seemed to have the most uniform distribution of colors. There aren't many candies you can actually play with and keep clean hands, after all M&M's melt in your mouth, not in your hand, right? That colorful candy coated shell is what has made these brand a natural companion for hungry gamers worldwide, since Atari. And, now you have more reason than ever to pick up a bag and play with M, as you relive your childhood video game favorites and enter to win an amazing Xbox One and Gaming With M bundle in the #FueledByMM Pixel Art Contest. Check out my stop motion video below for some sweet inspiration; can you name all of the video games represented? What Daughter Says: I can snack into the wee hours of the morning, while fighting zombies, thanks to melt-free M&M's. Can you name all of the video games represented in the video above? I cannot admit to recognizing the characters in your video but I certainly appreciate the effort you put into making it. Great job! Your pixel art is AMAZING! Girlfriend, how do you get it all done. Your creativity and your blog always inspire me to do more. Wow, you did such an awesome job with your pixel art! I am super impressed!! Cool video and pixel art. Great job! And I too have fond memories of Zelda. I've had more than a few nights of staying up late to play video games. My choice of M&M snacking is tossing a handful in when the popcorn bag is still warm.....they get all melty and delicious! Oh my goodness! 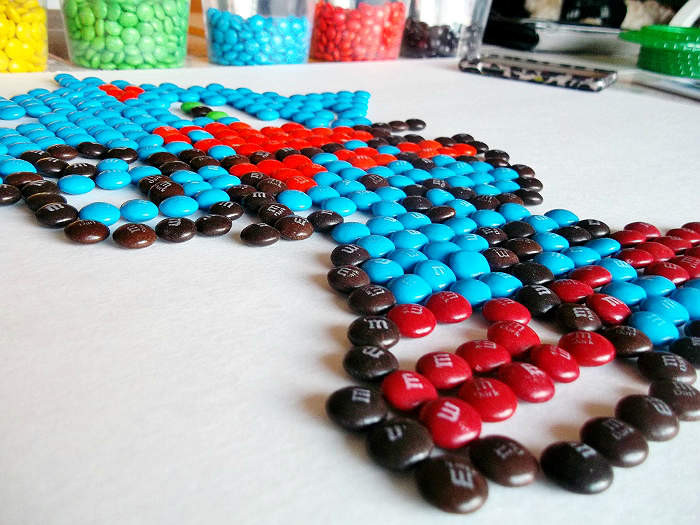 Your M&M pixel art is amazing! 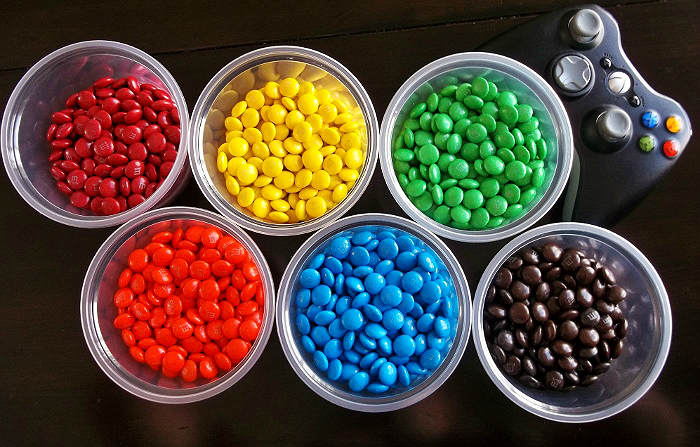 I couldn't think of anything to do with M&M's and you totally blew it out of the park! I love the Mario and Zelda and Pokemon! That is awesome! My kids would love to come play M&M's with you! Stop it, so cute!! I love Sonic. And chocolate. You totally got me on this one! What fun and very creative! Wow. And I thought myu gingerbread house was cute -- you just upped the ante! This art is too cool - and very yummy! Holy Cow, that's pretty darn cool. I recognized most of the characters. Total "back in the day" gaming flashbacks happening here! LOL So cute!